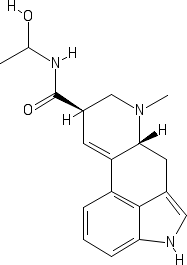 Lysergic Acid Amide (LSA) is a compound of natural origin that structurally resembles the potent artificial psychedelic compound LSD. LSA itself is classified as a sedative. LSA occurs in the seeds of morning glories and similar plants as a decomposition product of lysergic acid hydroxyethylamide (LSH). LSH is believed by some to have psychedelic properties similar to LSD. Animal tests have shown LSH produces stimulant effects similar to LSD, while LSA produces sedation. LSA can be prepared by decomposing ergotoxine or ergotinine in alcoholic potassium hydroxide. It's theoretically possible that LSH can also be decomposed to LSA in alcoholic potassium hydroxide. 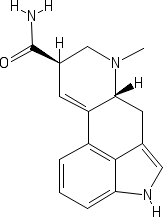 Lysergic Acid Hydroxyethylamide (LSH) is an adduct of lysergic acid amide and acetaldehyde. The LSA adducts ergotoxine and ergotinine can be decomposed in alcoholic potassium hydroxide. It's theoretically possible that LSH can also be decomposed to LSA in alcoholic potassium hydroxide. This section is purely anecdotal, and lacks scientific evidence. Anecdotal reports indicate that the adduct LSH can form by simply mixing lysergic acid amide and acetaldehyde in acidic solution. Anecdotal reports also indicate that LSA can form adducts with several other aldehydes, some of which appear to be active, although scientific studies are lacking. Theoretical adducts prepared with peppermint oil are claimed to create LSH, however the actual content of acetaldehyde in most peppermint oil is very low. It typically contains other aldehydes in higher quantity. If an adduct forms by this process it is very likely an adduct of something other than acetaldehyde. Anecdotal reports indicate that this adduct decomposes over time and should be used shortly after creation. Reports indicate profound effects similar to LSD. Some users have experienced extreme anxiety at higher doses. This adduct is unfortunately notorious for failing to form, and is often used as "proof" that such adducts don't form. Scientific evidence is lacking for both sides of the debate, although subjective effects indicate something is happening beyond placebo when the adduct formation is "successful". Theoretical adducts prepared with various types of wines high in acetaldehyde (sherry being a good choice), might actually create some amount of LSH. Some of these wines produce substantial amounts of acetaldehyde. Reports indicate these wines can produce profound effects similar to those of LSD. While there's no doubt that these wines have produced subjective effects somewhat different from LSA, such wines have not been scientifically tested for actual LSH content. It's possible the altered subjective effects are caused by an unknown interaction with compounds in the wine other than acetaldehyde. The cinnamaldehyde adduct is theorized to be an adduct of 2 molecules of LSA and 1 molecule of cinnamaldehyde, rather than a 1:1 ratio. It's theorized to form a 2:1 ratio based on similar cinnamaldehyde adducts such as cinnamylidene-bisacetamide and cinnamylidene-bisphenylacetamide, which are proven to form without the need for a catalyst. Cinnamylidene-bislysergamide is the theoretical adduct made from 2 molecules of LSA and 1 molecule of cinnamaldehyde. The less likely adduct to form is cinnamylidene-lysergamide, which is a 1:1 ratio of cinnamaldehyde to LSA. It's not known if any of these actually form, despite strong anecdotal evidence that some kind of reaction occurs. Scientific studies are sorely lacking. The theoretical adduct created with cinnamaldehyde made by simply dissolving LSA in cinnamon oil, appears to produce radically different subjective experiences that LSA does alone. It has a rapid onset, rapid peak, and far shorter duration that LSA alone. Because of the rapid onset, short duration, and radically different subjective effects, many believe this theoretical adduct is solid proof that either adducts form from mixing certain aldehydes with lysergic acid amide, or other chemical reactions occur. Anecdotal reports indicate that this adduct is very stable, lasting many months at room temperature. Scientific data is unfortunately lacking. In support of this theoretical adduct, it's been noted that cinnamaldehyde is proven to form adducts with several amines, amides, and other compounds without the need for a catalyst. See the article Cinnamaldehyde for more details. Defat the ground seeds with petroleum ether. Extract with an acetone-tartaric acid solution. Evaporated off the acetone on a water bath. Neutralized the resulting tartaric acid solution. Extract with methylene chloride to obtain the alkaloids. Appearance: Solutions of the base give a bluish-violet fluorescence in UV light, which is particularly evident in acetone as the solvent. It gives an alkaline reaction with moist litmus paper. Solubility: soluble in methylene chloride. Readily soluble in acetone, soluble in chloroform and ethyl acetate. Sparingly soluble in methyl alcohol, ethyl alcohol, ether, benzene, and almost insoluble in light petroleum and water. Crystallization in acetone: crystallizes readily from aqueous acetone in long colorless plates. Crystals from aqueous acetone are hydrates, stable in air but completely loses its water when kept over sulfuric acid in a vacuum desiccator. Crystallization in methyl alcohol: LSA is sparingly soluble in methyl alcohol and is conveniently separated from more soluble impurities by this solvent. It crystallizes in colorless prisms which contain one molecular proportion of methyl alcohol, which is retained with remarkable tenacity and is not completely removed after many hours of heating at 90 C in a vacuum. Decomposition: LSA is decomposed by alkali into the carboxylic acid lysergic acid. LSA crystals from acetone decompose with frothing at 115 C and on further heating blacken and undergo further decomposition at about 230 C. Crystals from methyl alcohol decompose with frothing at about 135 C; blackening with evolution of gas occurs at about 230 C.
Preparation: LSA hydrochloride can be prepared by treating a solution of LSA freebase in alcohol with dilute hydrochloric acid and adding ether. Appearance: colorless plates, crystallized from methyl alcohol by addition of ether or from water. Decomposition: on heating, LSA hydrochloride gradually becomes grey at approximately 200 C and decomposes with frothing and formation of a black tar at 255-260 C.
Preparation: LSA hydrobromide can be prepared by treating a solution of the LSA freebase in acetone with hydrobromic acid, and crystallized by the addition of ether. Appearance: It crystallizes in colorless prisms. Decomposition: contracts at about 200 C, and gradually darkens and at 260 C, and decomposes with evolution of gas and the formation of a black tar. Preparation: LSA nitrate can be prepared by treating a solution of LSA freebase in acetone and alcohol with dilute nitric acid and adding ether. Appearance: It crystallizes in long colorless plates. Decomposition: become grey at approximately 200 C and decomposes with the evolution of gas and blackening at 225-230 C.
Preparation: LSA picrolonate can be prepared in acetone solution, from which its separated. Decomposition: darkens at 210 C and decomposes at 215 C, giving a black tar. Preparation: LSA perchlorate can be prepared by adding a solution of sodium perchlorate in water to a solution of LSA freebase in water containing a little acetic acid. Crystallization: can be recrystallized from alcohol. Decomposition: gradually darkens at about 200 C and decomposes at 225 C, giving a black tar. Solubility: sparingly soluble in alcohol.